Lara Croft and the Guardian of Light is an action-adventure game developed by Crystal Dynamics and published by Square Enix for Microsoft Windows, PlayStation 3, Xbox 360, Android and, iOS through digital distribution. It is part of the Tomb Raider series, but unlike previous games, the game does not carry the Tomb Raider brand and has a heavy emphasis on cooperative gameplay. In multiplayer, players take the role as either Lara Croft or a 2,000-year-old Mayan warrior named Totec. They must work together in order to stop the evil spirit Xolotl and retrieve the Mirror of Smoke. A single-player campaign mode is available that does not include the non-playable character AI following or helping Lara. In the United States and United Kingdom, Guardian of Light was released for the Xbox Live Arcade on 18 August 2010; it was released a month later on 28 September for PlayStation Network and Steam. Though local cooperative was available at the initial release for all versions, online cooperative was later added. In North America, on 16 December 2010, the video game was released for iOS devices which included cooperative with Wi-Fi and Bluetooth options. The first downloadable content (DLC) map pack was released for free for a limited time. Lara Croft and the Guardian of Light was well received by critics. The Xbox 360 version of the game holds an average score of 85/100 and 86.36% on the game aggregate sites Metacritic and GameRankings, respectively. In September 2010, IGN listed Lara Croft and the Guardian of Light fourteenth in their top twenty-five Xbox Live Arcade titles of all time. Critics felt that the game was an excellent fit for Lara Croft. Guardian of Light sold 98,000 copies on Xbox Live in its first six weeks, and as of 22 August 2013, the game has sold more than 1 million copies on all platforms. A sequel titled Lara Croft and the Temple of Osiris was released in 2014 for Microsoft Windows, PlayStation 4 and Xbox One. Lara Croft and the Guardian of Light was the first game in the series to be published by Square Enix. Guardian of Light is played from a fixed perspective, similar to classic two dimensional isometric games. Unlike previous installments of the series, which were adventure games with a virtual camera viewpoint, The Guardian of Light is a non-linear "arcade-inspired" action game with a fixed isometric camera, similar to Tomb Raider: The Prophecy for Game Boy Advance. The game also features cooperative gameplay, and players can take control of either Lara or an ancient Mayan tribesman named Totec. Each playable character possesses unique weapons and skills. Like with some previous installments, Lara retains her dual pistols with infinite ammunition and a grappling hook, which she is able to use to cross gaps and which Totec can tightrope walk across. Totec carries spears which can be used both as a weapon and on the environment, for Lara to climb on. Both characters carry unlimited "bombs" that can be dropped and detonated. Tombs can be explored and some have "booby-trap puzzles" to solve. The game does not have any loading screens once a level is started. The Guardian of Light may be played with a single player, and a second player may join at any time, whether online or locally. In the single-player campaign the only playable character is Lara; Totec cannot assist and Lara has all the tools required along with new abilities to make it through her own unique adventure. Puzzles and parts of the map are also different. Creative director Daniel Neuberger said that this was because he did not want the player to get frustrated by having to rely on AI. The campaign features eight to ten hours of gameplay. In multiplayer, a first in the series, gameplay has an emphasis on teamwork. Lara is able to use Totec's shield as a portable platform as he holds it above his head. She may also balance on spears that Totec throws in the wall, but Totec cannot, as they are not able to hold his weight. Totec can tightrope walk using Lara's grappling rope. As the game progresses, Totec learns from Lara how to use modern weapons, such as rifles. When enemies are killed, point scores appear above their bodies—red or blue—depending on whether Lara (red) or Totec (blue) scored the kill. There are pick-ups, such as gems, scattered throughout the levels that increase the player's score. Receiving high scores in each level rewards the players with new weapons and upgrades. To add competitiveness into the game, there are a limited number of enemies and gems in the world so the players may compete to kill and grab them all. The multiplayer mode reportedly features approximately six to eight hours of gameplay, depending on teamwork. The Guardian of Light stars Lara Croft, a fictional English archaeologist and Totec, an ancient Mayan warrior and leader of the Army of Light. An evil spirit called Xolotl is the antagonist. Some of his minions that he makes come to life include: giant spiders, demon like creatures, and huge trolls. Lara is again voiced by Keeley Hawes and Totec is newly voiced by Jim Cummings. Two thousand years ago in ancient Central America, a battle was waged between Totec, the Guardian of the Light, and Xolotl, the Keeper of Darkness. Totec's army was defeated when Xolotl used the mirror of smoke to unleash hordes of ghastly creatures that fought on his behalf. Totec survived the battle and found a way to defeat Xolotl, imprisoning him in the mirror of smoke and becoming its immortal guardian in the form of a stone statue. In the present day, Lara Croft reads of the legend and attempts to find the mirror. After a long and dangerous journey she is successful. While examining the mirror, she is caught unaware by a band of mercenaries. Led by the local warlord, they had followed her into the temple. Unknowing or unbelieving of the curse upon the mirror, the warlord takes it from Lara. His reckless handling of the mirror releases Xolotl. The stone statue of Totec comes to life and warns Lara that Xolotl must be stopped before the light of dawn. Depending on the number of players participating, Lara and Totec either join forces or go their separate ways to try to stop Xolotl. Guardian of Light is not part of the main Tomb Raider brand, instead it was intended to start a new series simply titled "Lara Croft". Brand director Karl Stewart said, "When Underworld was finished, that was the end to the trilogy, and kind of the end of a whole era for us. We took a step back as a studio and spent a couple of months experimenting, trying to make a decision on how to go forward". Stewart also said that everyone who worked on Guardian of Light also worked on the previous three games (Tomb Raider: Legend, Tomb Raider: Anniversary, and Tomb Raider: Underworld). Guardian of Light uses the same game engine as Tomb Raider: Underworld and features real-time lighting effects, realistic shadows and "tons" of physics-based objects. Vegetation sways in the wind and reacts when the player walks through it. The environments have a "nice sense of scale". The game's producer, Forest Large, said in a podcast that New Orleans was considered as a location; though due to time restraints, the location was ultimately decided to be Central America and elements from previous games, such as plants, were borrowed and modified for Guardian of Light. Crystal Dynamics stated on their Facebook page that development on Guardian of Light had not affected development on the next main installment and reboot of the franchise, titled Tomb Raider. Lara Croft and the Guardian of Light uses recycled musical cues from Legend, Anniversary, and Underworld by composers Troels Brun Folmann and Colin O'Malley. Lara Croft and the Guardian of Light was shown at E3 2010 on 14 June 2010. It is a download only title and was released on Microsoft's Xbox Live Arcade on 18 August 2010. Originally, cooperative online gameplay was to be enabled on 28 September, the day of the PC and PlayStation Network release. However, on-line cooperative was delayed for all three platforms until a later date. Karl Stewart said, "The agreement with Microsoft is, in order to participate in their hugely successful Summer of Arcade promotion there is a window of exclusivity. That window of exclusivity is a set four weeks." The Microsoft Windows version was distributed exclusively by the digital distribution platform Steam. Online cooperative was made available for the PlayStation 3 on 22 November 2010. The Microsoft Windows version also received online cooperative play, being patched one day later. In North America, on 16 December 2010, Crystal Dynamics released an iOS version of Guardian of Light for the iPod, iPhone, and iPad. Although the level layouts of the game are identical to the PC, Xbox Live and PlayStation Network versions, it only contains 10 levels instead of 14, skipping straight to the level "Xolotl's Stronghold" after "Twisting Bridge", and doesn't include the DLC; online cooperative play is available with both Wi-Fi and Bluetooth options. On 20 February 2018, Microsoft announced that the Xbox 360 version of the game was now backwards compatible with the Xbox One. Guardian of Light received extended support after its official release date with five downloadable content packs, which were released from October through December 2010. Three of the packs, "All the Trappings", "Things That Go Boom", and "A Hazardous Reunion", contain new maps and puzzles, although the second pack was not released on Xbox 360 due to "unforeseen problems". The other two DLC packs feature alternate playable characters from other Eidos Interactive-owned series - Kain and Raziel of Crystal Dynamics' Legacy of Kain series, and Kane and Lynch of IO Interactive's Kane & Lynch games. The first downloadable content pack, entitled All The Trappings, received a thirty-day free release alongside the online cooperative patch on 27 October 2010 for Xbox 360. Lara Croft and the Guardian of Light was very well received by critics. The Xbox 360 version of the game holds an average score of 85 out of 100 on the aggregate website Metacritic. The PlayStation 3 version of the game holds an average score of 84 out of 100 and the PC version holds an 82 out of 100. On another aggregate site, GameRankings, the Xbox 360 version has an 86% score. The PlayStation 3 version has an 83% score and the PC version has an 82% score. In a September 2010 ranking, IGN listed Lara Croft and the Guardian of Light fourteenth in their top twenty-five Xbox Live Arcade titles of all time. Initial sales show the game has done well, with Guardian of Light selling 98,000 copies on Xbox Live in its first six weeks. As of October 2010, over 111,000 copies were sold on Xbox Live and 138,000 as of year-end 2010. On 22 August 2013, Square Enix head of product development, Darrell Gallagher, revealed that the game had sold more than 1 million copies on all platforms. 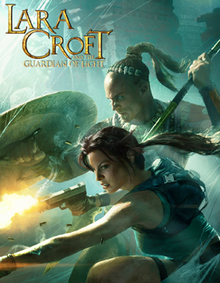 Daemon Hatfield of IGN gave the Xbox 360 version of the game a rating of 8.5 saying "Guardian of Light is the best Tomb Raider game in a long time." Though he said the story and dialogue are "definitely the weakest parts of this game." Chris Watters of GameSpot also gave the Xbox 360 version an 8.5 rating, and said "Punctuated by clever puzzles and lush visuals, each level begs to be replayed thanks to the varied and enticing challenges that promise substantial rewards." They did however, criticise the "cheesy and forgettable plot." Tom Hoggins from telegraph.co.uk stated "Lara Croft and the Guardian of Light restores the queen of adventure to her former glory." Matt Cabral of GamePro also gave the game a positive review, giving the game 4.5/5 and saying "A seamless blend of the series’ trademark puzzling, exploration and combat gameplay in a neat new package." Like most critics, GamePro expressed that the game's weak point was the storyline, but added "Guardian of Light signals a triumphant return for one of gaming's most iconic heroines." Keza MacDonald of Eurogamer gave Guardian of Light a 9 out of 10 and stated "The story is cheesy nonsense but Lara is cool as ever, responding to the appearance of massive lizard demons with a calm 'Oh, my goodness'." Meagan Marie of Game Informer gave the game a 9 out of 10, closing her review with "In taking a chance with Guardian of Light, Crystal Dynamics rediscovered Lara's latent potential. For those of you concerned with the direction this ancillary title has taken, rest easy. We now know that Lara Croft is as versatile as she is flexible." Tom Orry of VideoGamer.com gave the game 9 out of 10, saying "[Lara Croft and the Guardian of Light is] undoubtedly one of the most visually impressive downloadable titles on the market." ^ a b IGN Staff (16 September 2010). "The Top 25 Xbox Live Arcade Games". IGN. News Corporation. Archived from the original on 18 September 2010. Retrieved 16 September 2010. ^ a b Langley, Ryan (23 November 2010). "In-Depth: Xbox Live Arcade Sales Analysis, October 2010". Gamasutra. Think Services. Retrieved 23 November 2010. ^ a b "Darrell Gallagher's Blog - How do you tackle industry change?". Gamasutra. Retrieved 23 August 2013. ^ a b Gibson, Ellie (18 March 2010). "Lara Croft and the Guardian of Light". Eurogamer. Eurogamer Network. p. 3. Archived from the original on 11 June 2010. Retrieved 9 June 2010. ^ a b Ishaan (11 March 2010). "Lara Croft and the Guardian of Light Isn't The Next "Tomb Raider". Siliconera. CraveOnline Media. Archived from the original on 11 June 2010. Retrieved 9 June 2010. ^ a b c d e f "Lara Croft and the Guardian of Light First Look". GameSpot. CBS Interactive. 5 March 2010. Archived from the original on 11 June 2010. Retrieved 8 March 2010. ^ a b c d "Lara Croft And The New Addictive Game". Kotaku. Gawker Media. 18 May 2010. Archived from the original on 11 June 2010. Retrieved 10 June 2010. ^ Wilson, Jeffrey L. (15 June 2010). "'Lara Croft : Guardian of Light' Becomes XBLA Download". PC Magazine. Ziff Davis Publishing Holdings Inc. Retrieved 16 June 2010. ^ a b "Crystal Dynamics on Lara Croft's new direction". Gamespot. CBS Interactive. 20 May 2010. Archived from the original on 10 June 2010. Retrieved 10 June 2010. ^ a b c "Lara Croft and the Guardian of Light: Preview". Yahoo! Games. Yahoo! UK. Archived from the original on 14 June 2010. Retrieved 11 June 2010. ^ a b Gibson, Ellie (18 March 2010). "Lara Croft and the Guardian of Light". Eurogamer. Eurogamer Network. p. 2. Archived from the original on 11 June 2010. Retrieved 9 June 2010. ^ a b Puleo, Nicholas (3 June 2010). "Lara Croft and the Guardian of Light Co-Op Hands on Preview". Co-Optimus. Archived from the original on 11 June 2010. Retrieved 10 June 2010. ^ a b "Lara Croft and the Guardian of Light Podcast #2" (mp3). Eidos Interactive. Retrieved 3 October 2010. ^ a b Gibson, Ellie (18 March 2010). "Lara Croft and the Guardian of Light". Eurogamer. Eurogamer Network. p. 1. Archived from the original on 11 June 2010. Retrieved 9 June 2010. ^ Gibson, Ellie (18 March 2010). "Lara Croft and the Guardian of Light". Eurogamer. Eurogamer Network. p. 4. Archived from the original on 11 June 2010. Retrieved 9 June 2010. ^ Keir Edmonds (23 July 2010). "LCGol - Podcast 1 with Forest" (Podcast). Crystal Dynamics. Retrieved 26 July 2010. ^ Molina, Brett (10 June 2010). "E3 2010 walkthrough: Square Enix". USA Today. Gannett Company. Archived from the original on 11 June 2010. Retrieved 10 June 2010. ^ Magrino, Tom (6 July 2010). "Microsoft dates Summer of Arcade lineup". GameSpot. CBS Interactive. Archived from the original on 6 July 2010. Retrieved 6 July 2010. ^ Kietzmann, Ludwig (6 August 2010). "Lara Croft and the Guardian of Light will not have online co-op until Sept. 28". Joystiq. AOL Games. Retrieved 6 August 2010. ^ McElroy, Griffin (21 September 2010). "Lara Croft and the Guardian of Light PS3 and PC won't launch with online co-op". Joystiq. AOL. Retrieved 30 September 2010. ^ Yin-Poole, Wesley (16 July 2010). "Crystal Dynamics talks Lara". Eurogamer. Eurogamer Network. Archived from the original on 19 July 2010. Retrieved 18 July 2010. ^ Callaham, John (20 May 2010). "New Lara Croft game confirmed as using Steam for DRM". Big Download. AOL. Archived from the original on 11 June 2010. Retrieved 10 June 2010. ^ McElroy, Justin (22 November 2010). "Lara Croft and the Guardian of Light online patch now available on PS3". Joystiq. AOL. Retrieved 22 November 2010. ^ Fletcher, JC (23 November 2010). "Lara Croft co-op patch arrives for PC". Joystiq. AOL. Retrieved 23 November 2010. ^ Gilbert, Ben (15 December 2010). "Lara Croft and the Guardian of Light exploring iDevices tomorrow". Joystiq. AOL. Retrieved 16 December 2010. ^ Stewart, Karl (10 March 2011). "Unfortunately due to unforeseen problems, Challenge Pack #2 for Lara Croft GOL will not be released on the Xbox 360". Twitter. Retrieved 10 March 2011. ^ Fahey, Mike (6 August 2010). "To Lara Croft and the Guardian of Light DLC Means Something Different". Kotaku. Gawker Media. Retrieved 9 August 2010. ^ Grant, Christopher (6 August 2010). "Lara Croft and the Guardian of Light plunders PS3, Steam on Sep. 28, five DLC packs in 2010". Joystiq. AOL Games. Retrieved 9 August 2010. ^ Adams, Ross (26 October 2010). "Free Guardian of Light DLC alongside online patch". xblafans.com. Retrieved 26 October 2010. ^ "Lara Croft and the Guardian of Light co-op patch and DLC available now". 27 October 2010. p. 1. Retrieved 27 October 2010. ^ a b "Lara Croft and the Guardian of Light for Xbox 360". GameRankings. CBS Interactive. Retrieved 23 June 2018. ^ a b "Lara Croft and the Guardian of Light for PlayStation 3". GameRankings. CBS Interactive. Retrieved 23 June 2018. ^ a b "Lara Croft and the Guardian of Light for PC". GameRankings. CBS Interactive. Retrieved 16 December 2010. ^ a b "Lara Croft and the Guardian of Light for Xbox 360 Reviews". Metacritic. CBS Interactive. Retrieved 23 June 2018. ^ a b "Lara Croft and the Guardian of Light for PlayStation 3 Reviews". Metacritic. CBS Interactive. Retrieved 23 June 2018. ^ a b "Lara Croft and the Guardian of Light for PC Reviews". Metacritic. CBS Interactive. Retrieved 23 June 2018. ^ "Lara Croft and the Guardian of Light for iPhone/iPad Reviews". Metacritic. CBS Interactive. Retrieved 23 June 2018. ^ a b MacDonald, Keza (16 August 2010). "Lara Croft and the Guardian of Light Xbox 360 Review". Eurogamer. Eurogamer Network. Retrieved 22 August 2010. ^ a b Marie, Meagan (13 August 2010). "Crystal Dynamics Takes A Risk And Reaps The Reward". Game Informer. GameStop Corporation. Retrieved 20 August 2010. ^ Keast, Matthew (17 August 2010). "Lara Croft and the Guardian of Light Review". GamesRadar. Future Publishing. Retrieved 22 August 2010. ^ a b Hatfield, Daemon (16 August 2010). "Lara Croft and the Guardian of Light Xbox 360". IGN. News Corporation. Archived from the original on 18 August 2010. Retrieved 22 August 2010. ^ Reyes, Francesca (18 August 2010). "Lara Croft and the Guardian of Light". Official Xbox Magazine. Future Publishing. Retrieved 22 August 2010. ^ Johnson, Stephen (20 August 2010). "Lara Croft and the Guardian of Light Review". X-Play. G4TV. Retrieved 22 August 2010. ^ Langley, Ryan (13 October 2010). "In-Depth: Xbox Live Arcade Sales Analysis, September 2010". Gamasutra. Think Services. Retrieved 19 October 2010. ^ Langley, Ryan (28 January 2011). "XBLA: In-Depth: Xbox Live Arcade Sales Analysis For All Of 2010". Gamerbytes. Retrieved 31 January 2011. ^ Watters, Chris (18 August 2010). "Lara Croft and the Guardian of Light Review". GameSpot. CBS Interactive. Retrieved 20 August 2010. ^ Hoggins, Tom (18 August 2010). "Lara Croft and the Guardian of Light video game review". Telegraph.co.uk. Telegraph Media Group. Retrieved 7 September 2010. ^ Cabral, Matt (17 August 2010). "Lara Croft and the Guardian of Light Review from GamePro". GamePro. IDG. Archived from the original on 19 August 2010. Retrieved 22 August 2010. ^ Orry, Tom (23 August 2010). "Lara Croft and the Guardian of Light Review for Xbox 360". VideoGamer.com. Pro-G Media. Retrieved 9 October 2010.